Dendritic cells are blood cells present in every person's bloodstream. They function as an immune cell but are present in small numbers. They identify cancer cells, process them into bits, and jumpstart the immune response by bringing the foreign substance to the attention of the rest of the immune system (T cells). The activated immune system is then able to circulate throughout the body and destroy the cancer cells. In cancer, the immune system fails; cells of the immune system fail to recognize the cancer cells. The immune system doesn't "see" tumors as dangerous or foreign, and doesn't mount a strong attack against them. Another reason tumors may not stimulate an immune response is that the cancer cells develop ways to escape the immune sytem. Cancer occurs because the immune system has failed. Numerous researches now prove that this defect in the immune system can be corrected outside the body (ex vivo technology). DENVAX is dendritic cell therapy, which involves the extraction of mononuclear (CD14+) cells from the patient's own blood, transformation of these cells into cancer-fighting cells and giving back to the patient. Mononuclear (CD14+) cells are extracted from the patient's peripheral blood. These cells are cultured, exposed to maturation stimuli and then re-infused into the same patient on the the 8th day of blood collection. 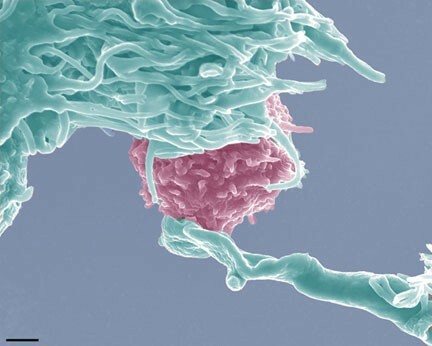 Dendritic cells should recognize the patient's tumor cells and target them once inside the body. But before that they must undergo 'maturation'. For this the dendritic cells are exposed to tumor antigen-self or non-self.